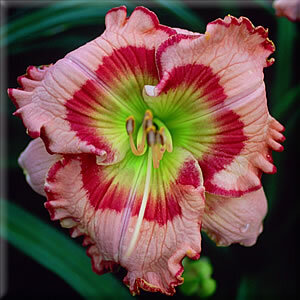 (Dan Trimmer, 2004) Tetraploid ((Raspberry Beret X Dan Mahony) X Tet Connie Burton) 26" EM Re. Ev. 5 1/4" PARROT JUNGLE is another "special face" from my eyed Tetra Connie Burton breeding. 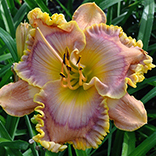 I've observed that nothing sets off color in daylilies like intense green throats. For years I've culled beautiful seedlings due mainly to throat color but now I've finally got an introduction that is largely about the huge parrot colored green inside of a stunning cherry red eye. The petal color of PARROT JUNGLE is a clean dark pink edged in red. The form is round and full and bud count is about 25. Fertile both ways PARROT JUNGLE looks like nothing else in the garden.